These issues aside, there is a feature I’d like to see added that seems so brain-dead simple. Please add timers to notification centre! I, along with many other people use Siri in the kitchen constantly. “Set a timer for 10 minutes”, is a phrase you’ll always hear in my kitchen when I put a pot of pasta on to boil. In response to this command, Siri brings up a nicely animated egg timer animation. If I return to the home screen, instead of s simple swipe from the top of the screen to see how long is left, I need to find the clock app, then switch to the timer application. 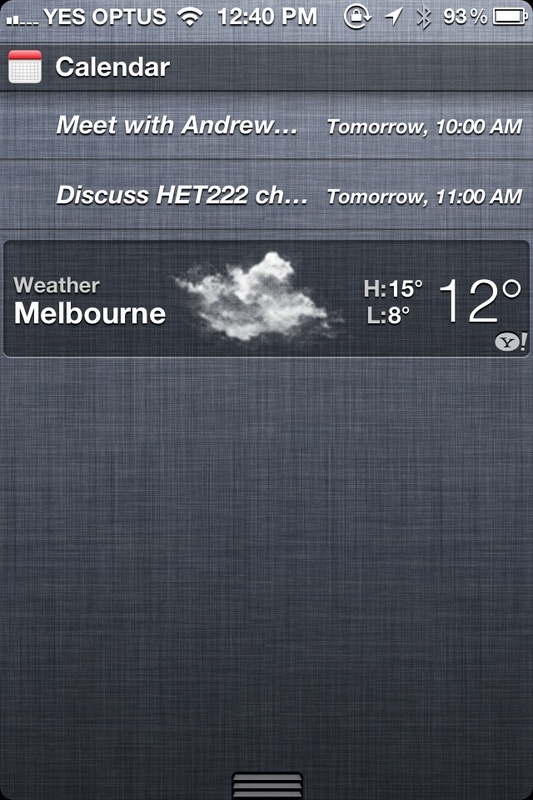 Notification centre is meant as a way to check useful info at a glance. Timers fit perfectly into this category and it seems like a trivial thing to add. Below is a very rough mockup of how I see this being implemented. Hopefully this will be added into the final iOS 6 release, or perhaps iOS 6.1? Bingo man! Any of the the Siri type replies such as this would be perfect for notification centre!